The Blue Rooster Chiminea Outdoor Fireplaces Cast Aluminum Cast Iron . Since 1997 our mission has been to design/manufacture high quality chimineas for people to enjoy their time together outdoors. Our commitment to customer service has earned us trust and respect, as has our guarantee, which assures that we stand behind everything we sell. 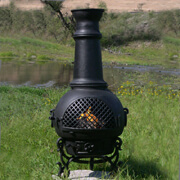 The Blue Rooster Chiminea is the cleanest burning, longest lasting, chiminea available. They are designed to be safe for use on your deck or patio. They will withstand salt air, freezing cold, and the harshest environments. Easy to light, easy to maintain, and burn with little or no smoke. Any questions please call us at 218-755-7515 or Toll Free 1-800-303-4312. We look forward to hearing from you. If you are new to outdoor fireplace products please take time to read our 10 Tips to Buying an Outdoor Fireplace. 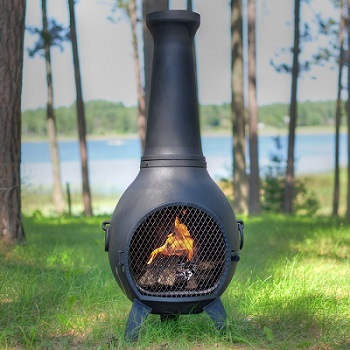 The video below is a short 2 minute video featuring our most popular chiminea models. All products you see on this web site have been design patent applied for under US Copyright Law by The Blue Rooster Company. If you see similar designs elsewhere on the internet, they are not Blue Rooster Co. products unless indicated. Although our product designs may be duplicated, our manufacturing quality and great service cannot.